The Lisfranc joint, which represents the articulation between the midfoot and forefoot, is composed of the five tarsometatarsal (TMT) joints. Jacques Lisfranc de Saint-Martin (1790-1847), a field surgeon in Napoleon's army serving on the Russian front, described a new amputation technique across the five TMT joints—one that did not require any bony osteotomy—as a swift solution to forefoot gangrene secondary to frostbite. This anatomic landmark became known as the Lisfranc joint, a term that is used today in the description of a wide spectrum of traumatic injuries to the TMT area of the foot. The Lisfranc ligament is a solitary ligament that connects the first ray (first metatarsal-medial cuneiform articulation) to the middle and lateral columns of the foot. It is attached to the lateral margin of the medial cuneiform and the medial and plantar surface of the second metatarsal (MT) base. This is the only ligamentous support between the first ray and the second ray at midfoot level. Although Lisfranc described the joint that bears his name, he did not actually describe the injury pattern well known by this eponym. As currently understood, a Lisfranc injury encompasses everything from a sprain to a complete disruption of normal anatomy through the TMT joints. This type of injury was later described in equestrian riders who got their foot caught in a stirrup when they fell from a horse. Lisfranc joint injuries are rare, complex, and often misdiagnosed or inadequately treated. Injuries to the Lisfranc articulations frequently lead not only to arthritis but also to severe pain. Injury to the Lisfranc ligament, even in isolation, will result in functional instability with loss of longitudinal and transverse arch  ; early recognition and treatment of injuries to this ligament are important for preserving normal foot biomechanics and function. Lisfranc fracture dislocations and sprains carry a high risk of chronic secondary disability. Best outcomes for these injuries require prompt recognition and then anatomic reduction and stabilization. A transverse line through these joints is not straight but highlights a recess, termed the keystone (much as in a Roman arch), that is formed by the second TMT joint. This joint lies approximately 1 cm proximal to the first TMT joint line and 0.5 cm proximal to the third TMT joint line. The joints are bound by thick plantar ligaments that form an interlocking pattern between the tarsal and lesser MT bones 2-5. These are reinforced by attachments of the posterior tibialis tendon. The first TMT joint also has strong plantar ligaments across the joint; these are reinforced by the attachment of the peroneus longus and anterior tibialis tendons. The Lisfranc ligament originates from the plantar lateral aspect of the medial cuneiform and attaches to the plantar medial aspect of the second MT base. It is the thickest of the ligaments in this region, measuring up to 1 cm wide. This ligament provides the only soft-tissue link between the medial ray and the lesser MT and is responsible for this area's stability. Motion at the TMT joints is variable. The second and third joints are the stiffest, with minimal motion in the dorsal or plantar plane and none in the medial or lateral plane. The third and first TMT joints exhibit progressively more motion in both planes but still are relatively stiff and mainly function as areas of adjustment to allow the MT heads to share weight equally. The lateral two TMT joints demonstrate roughly three times more motion in the dorsal or plantar plane than the first TMT joint does. That motion is significant in the function of the foot and must be preserved to maintain normal function, especially if stiffness occurs in the medial and middle columns. In the column theory, the middle column is more important for rigidity, and the medial and lateral columns are more important for shock absorption during gait. The lateral joints are more important for their mobile contributions to the balancing of forefoot weightbearing. This principle is important in treating these injuries. In diabetic patients with neuropathy or those with idiopathic insensate feet, subacute diastasis can occur over time without notable pain. The absence of pain allows this gradual process to continue, so that a minor injury can lead to a Lisfranc injury. In the authors’ opinion, the hallmark of an impending Lisfranc injury is the loss of the recess of the second MT base with the middle cuneiform, also known as the keystone. Radiographs are considered abnormal when weightbearing anteroposterior (AP) views of the foot show the first TMT joint to be at the same level as the second TMT joint, indicating proximal migration of the first ray (see the image below). Radiograph illustrating diabetic patient with first ray instability of the right foot. The articular surfaces of the second and first metatarsal are level in the transverse plane, indicating proximal migration of the first ray. The left foot shows the advanced stage of an untreated Lisfranc injury with similar first ray instability. In low-energy settings, TMT injuries are caused by a direct blow to the joint or by axial loading along the MT, either with medially or laterally directed rotational forces. In high-energy injuries, the method of loading is not significantly different, but the energy absorbed by the articulations results in significantly more collateral damage to bony and soft-tissue structures, creating such injuries as MT fractures, cuneiform instabilities, and cuboid fractures. The damage to the tight ligamentous structures of this joint complex creates an unstable foot for weightbearing. The sense of instability and pain can occur whether or not overt evidence of instability is present. Chronic sprains resulting from relatively minor trauma can be the most debilitating sprains as a consequence of pain with weightbearing. Good results are achieved from open reduction with internal fixation (ORIF) at up to 6 weeks, but poor outcomes are seen after this time, arising from articular destruction, malalignment, and poor soft-tissue envelope. Schepers et al performed a pedobarographic study that showed reduced contact time and reduced contact area of the forefoot in 26 patients relative to the uninvolved side. Whereas these patients expressed good satisfaction with the procedure (primary ORIF [PORIF]), with Short Form (SF)-36 scores averaging 101, their functional scores were only fair, with a median American Orthopaedic Foot and Ankle Score (AOFAS) of 72 and a Visual Analogue Scale (VAS) score of 7. As with all surgical procedures, it is important to set appropriate expectations with patients early in the treatment process. Patients should be counseled regarding the risks and expected outcomes for each type of intervention. For those undergoing ORIF, preoperative explanation of the potential need for removal of hardware is important. The risk of development of posttraumatic arthritis and subsequent need for arthrodesis should be highlighted. For patients undergoing primary arthrodesis, discussion of the risk of nonunion and need for revision surgery is warranted. Kaar S, Femino J, Morag Y. Lisfranc joint displacement following sequential ligament sectioning. J Bone Joint Surg Am. 2007 Oct. 89(10):2225-32. [Medline]. Bulut G, Yasmin D, Heybeli N, Erken HY, Yildiz M. A complex variant of Lisfranc joint complex injury. J Am Podiatr Med Assoc. 2009 Jul-Aug. 99(4):359-63. [Medline]. Kalia V, Fishman EK, Carrino JA, Fayad LM. Epidemiology, imaging, and treatment of Lisfranc fracture-dislocations revisited. Skeletal Radiol. 2012 Feb. 41(2):129-36. [Medline]. Hardcastle PH, Reschauer R, Kutscha-Lissberg E, Schoffmann W. Injuries to the tarsometatarsal joint. Incidence, classification and treatment. J Bone Joint Surg Br. 1982. 64 (3):349-56. [Medline]. [Full Text]. Aronow MS. Treatment of the missed Lisfranc injury. Foot Ankle Clin. 2006 Mar. 11 (1):127-42, ix. [Medline]. Desmond EA, Chou LB. Current concepts review: Lisfranc injuries. Foot Ankle Int. 2006 Aug. 27(8):653-60. [Medline]. Lattermann C, Goldstein JL, Wukich DK, Lee S, Bach BR Jr. Practical management of Lisfranc injuries in athletes. Clin J Sport Med. 2007 Jul. 17 (4):311-5. [Medline]. Curtis MJ, Myerson M, Szura B. Tarsometatarsal joint injuries in the athlete. Am J Sports Med. 1993 Jul-Aug. 21(4):497-502. [Medline]. Nithyananth M, Boopalan PR, Titus VT, Sundararaj GD, Lee VN. Long-term outcome of high-energy open Lisfranc injuries: a retrospective study. J Trauma. 2011 Mar. 70(3):710-6. [Medline]. Kuo RS, Tejwani NC, Digiovanni CW, Holt SK, Benirschke SK, Hansen ST Jr, et al. Outcome after open reduction and internal fixation of Lisfranc joint injuries. J Bone Joint Surg Am. 2000 Nov. 82-A (11):1609-18. [Medline]. Lau S, Guest C, Hall M, Tacey M, Joseph S, Oppy A. Functional Outcomes Post Lisfranc Injury-Transarticular Screws, Dorsal Bridge Plating or Combination Treatment?. J Orthop Trauma. 2017 Aug. 31 (8):447-452. [Medline]. Philbin T, Rosenberg G, Sferra JJ. Complications of missed or untreated Lisfranc injuries. Foot Ankle Clin. 2003 Mar. 8(1):61-71. [Medline]. Schepers T, Kieboom B, van Diggele P, Patka P, Van Lieshout EM. Pedobarographic analysis and quality of life after Lisfranc fracture dislocation. Foot Ankle Int. 2010 Oct. 31(10):857-64. [Medline]. Patillo D, Rudzki JR, Johnson JE, Matava MJ, Wright R. Lisfranc injury in a national hockey league player: a case report. Int J Sports Med. 2007 Nov. 28 (11):980-4. [Medline]. Chilvers M, Donahue M, Nassar L, Manoli A 2nd. Foot and ankle injuries in elite female gymnasts. Foot Ankle Int. 2007 Feb. 28 (2):214-8. [Medline]. Kadel N, Boenisch M, Teitz C, Trepman E. Stability of Lisfranc joints in ballet pointe position. Foot Ankle Int. 2005 May. 26 (5):394-400. [Medline]. Gaweda K, Tarczyńska M, Modrzewski K, Turzańska K. An analysis of pathomorphic forms and diagnostic difficulties in tarso-metatarsal joint injuries. Int Orthop. 2008 Oct. 32 (5):705-10. [Medline]. Perron AD, Brady WJ, Keats TE. Orthopedic pitfalls in the ED: Lisfranc fracture-dislocation. Am J Emerg Med. 2001 Jan. 19(1):71-5. [Medline]. Sherief TI, Mucci B, Greiss M. Lisfranc injury: how frequently does it get missed? And how can we improve?. Injury. 2007 Jul. 38(7):856-60. [Medline]. Raikin SM, Elias I, Dheer S, Besser MP, Morrison WB, Zoga AC. Prediction of midfoot instability in the subtle Lisfranc injury. Comparison of magnetic resonance imaging with intraoperative findings. J Bone Joint Surg Am. 2009 Apr. 91(4):892-9. [Medline]. Woodward S, Jacobson JA, Femino JE, Morag Y, Fessell DP, Dong Q. Sonographic evaluation of Lisfranc ligament injuries. J Ultrasound Med. 2009 Mar. 28(3):351-7. [Medline]. Nunley JA, Vertullo CJ. Classification, investigation, and management of midfoot sprains: Lisfranc injuries in the athlete. Am J Sports Med. 2002 Nov-Dec. 30(6):871-8. [Medline]. Sheibani-Rad S, Coetzee JC, Giveans MR, DiGiovanni C. Arthrodesis versus ORIF for Lisfranc fractures. Orthopedics. 2012 Jun. 35 (6):e868-73. [Medline]. Smith N, Stone C, Furey A. Does Open Reduction and Internal Fixation versus Primary Arthrodesis Improve Patient Outcomes for Lisfranc Trauma? A Systematic Review and Meta-analysis. Clin Orthop Relat Res. 2016 Jun. 474 (6):1445-52. [Medline]. [Full Text]. Buda M, Kink S, Stavenuiter R, Hagemeijer CN, Chien B, Hosseini A, et al. Reoperation Rate Differences Between Open Reduction Internal Fixation and Primary Arthrodesis of Lisfranc Injuries. Foot Ankle Int. 2018 Sep. 39 (9):1089-1096. [Medline]. Ly TV, Coetzee JC. Treatment of primarily ligamentous Lisfranc joint injuries: primary arthrodesis compared with open reduction and internal fixation. A prospective, randomized study. J Bone Joint Surg Am. 2006 Mar. 88(3):514-20. [Medline]. Coetzee JC, Ly TV. Treatment of primarily ligamentous Lisfranc joint injuries: primary arthrodesis compared with open reduction and internal fixation. Surgical technique. J Bone Joint Surg Am. 2007 Mar. 89 Suppl 2 Pt.1:122-7. [Medline]. Henning JA, Jones CB, Sietsema DL, Bohay DR, Anderson JG. Open reduction internal fixation versus primary arthrodesis for lisfranc injuries: a prospective randomized study. Foot Ankle Int. 2009 Oct. 30(10):913-22. [Medline]. Albright RH, Haller S, Klein E, Baker JR, Weil L Jr, Weil LS Sr, et al. Cost-Effectiveness Analysis of Primary Arthrodesis Versus Open Reduction Internal Fixation for Primarily Ligamentous Lisfranc Injuries. J Foot Ankle Surg. 2018 Mar - Apr. 57 (2):325-331. [Medline]. Thordarson DB, Hurvitz G. PLA screw fixation of Lisfranc injuries. Foot Ankle Int. 2002 Nov. 23(11):1003-7. [Medline]. Ahmed S, Bolt B, McBryde A. Comparison of standard screw fixation versus suture button fixation in Lisfranc ligament injuries. Foot Ankle Int. 2010 Oct. 31(10):892-6. [Medline]. Panchbhavi VK, Vallurupalli S, Yang J, Andersen CR. Screw fixation compared with suture-button fixation of isolated Lisfranc ligament injuries. J Bone Joint Surg Am. 2009 May. 91(5):1143-8. [Medline]. Brin YS, Nyska M, Kish B. Lisfranc injury repair with the TightRope device: a short-term case series. Foot Ankle Int. 2010 Jul. 31(7):624-7. [Medline]. Lundeen G, Sara S. Technique tip: the use of a washer and suture endobutton in revision lisfranc fixation. Foot Ankle Int. 2009 Jul. 30(7):713-5. [Medline]. Baravarian B, Geffen D. Lisfranc tightrope. Foot Ankle Spec. 2009 Oct. 2(5):249-50. [Medline]. Watson TS, Shurnas PS, Denker J. Treatment of Lisfranc joint injury: current concepts. J Am Acad Orthop Surg. 2010 Dec. 18(12):718-28. [Medline]. Sanli I, Hermus J, Poeze M. Primary internal fixation and soft-tissue reconstruction in the treatment for an open Lisfranc fracture-dislocation. Musculoskelet Surg. 2012 Jun. 96 (1):59-62. [Medline]. Smith SE, Camasta CA, Cass AD. A technique for isolated arthrodesis of the second metatarsocuneiform joint. J Foot Ankle Surg. 2009 Sep-Oct. 48(5):606-11. [Medline]. Lee CA, Birkedal JP, Dickerson EA, Vieta PA Jr, Webb LX, Teasdall RD. Stabilization of Lisfranc joint injuries: a biomechanical study. Foot Ankle Int. 2004 May. 25 (5):365-70. [Medline]. Stern RE, Assal M. Dorsal multiple plating without routine transarticular screws for fixation of Lisfranc injury. Orthopedics. 2014 Dec. 37 (12):815-9. [Medline]. Kirzner N, Zotov P, Goldbloom D, Curry H, Bedi H. Dorsal bridge plating or transarticular screws for Lisfranc fracture dislocations. Bone Joint J. 2018 Apr 1. 100-B (4):468-474. [Medline]. Buda M, Hagemeijer NC, Kink S, Johnson AH, Guss D, DiGiovanni CW. Effect of Fixation Type and Bone Graft on Tarsometatarsal Fusion. Foot Ankle Int. 2018 Sep 1. 1071100718793567. [Medline]. Panagakos P, Patel K, Gonzalez CN. Lisfranc arthrodesis. Clin Podiatr Med Surg. 2012 Jan. 29(1):51-66. [Medline]. Cook KD, Jeffries LC, O'Connor JP, Svach D. Determining the strongest orientation for "Lisfranc's screw" in transverse plane tarsometatarsal injuries: a cadaveric study. J Foot Ankle Surg. 2009 Jul-Aug. 48(4):427-31. [Medline]. Gaines RJ, Wright G, Stewart J. Injury to the tarsometatarsal joint complex during fixation of Lisfranc fracture dislocations: an anatomic study. J Trauma. 2009 Apr. 66(4):1125-8. [Medline]. Williams JC, Roberts JW, Yoo BJ. Dorsalis pedis artery pseudoaneurysm after Lisfranc surgery. J Orthop Trauma. 2010 Nov. 24(11):e98-101. [Medline]. Clinical identification of typical plantar ecchymosis pattern observed in Lisfranc injuries. In this anteroposterior radiograph of a Lisfranc dislocation, note the disruption of the normal second tarsometatarsal alignment. 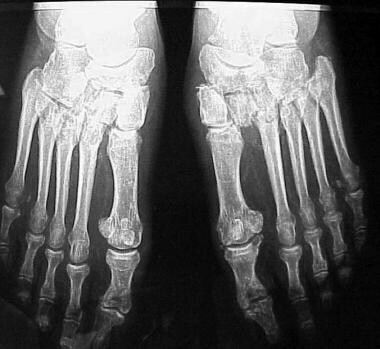 In this lateral radiograph of a typical Lisfranc injury, note the malalignment of the metatarsal bases with the midfoot. In this medial oblique radiograph of a normal foot, note the medial borders of the cuboid and fourth metatarsal base. They should be even, as depicted by the black lines. In this medial oblique radiograph of a Lisfranc injury, note the loss of alignment between the cuboid and fourth metatarsal base (black lines). This is diagnostic of a Lisfranc injury and is as important as recognition of the second tarsometatarsal instability. Stress view. This patient, with a suspected Lisfranc injury, presents with a normal appearing anteroposterior radiograph of the foot. Plantar ecchymosis and clinical presentation of pain warrant further investigation. In this radiograph, alignment of the medial border of the second metatarsal and the medial cuneiform is near normal. Patient is unable to bear weight due to a femur fracture sustained in the same accident. In this stressed view, with adequate anesthesia to the patient, the foot is stressed in a medial/lateral plane. The forefoot is forced laterally with the hindfoot brought medially. Note that the second tarsometatarsal joint opens up, and the normal alignment between the medial border of the second metatarsal base and the middle cuneiform is distorted. This injury requires surgical stabilization. Standard anteroposterior radiograph demonstrates a Lisfranc fracture dislocation. Determining the extent of fracture involving the joint is difficult with plain radiographs. CT scan in the coronal plane can demonstrate the extent of injury at the joint. Compare with the plain radiograph of this injury in the related image. Note the plantar avulsion, suggesting severe disruption of the plantar ligamentous structures. This diagram depicts the suggested fixation order of placement and alignment of screws for surgical fixation of unstable Lisfranc injuries. Preoperative anteroposterior radiograph demonstrates a Lisfranc dislocation. Preoperative lateral radiograph demonstrates a Lisfranc dislocation. Postoperative anteroposterior radiograph demonstrates reduction and fixation of Lisfranc dislocation. Postoperative lateral radiograph illustrates placement of fixation screws for stabilization of Lisfranc joint. Preoperative anteroposterior radiograph demonstrates a Lisfranc injury with proximal tarsal instability. The medial cuneiform is displaced medially, bringing the joint line level with the second. The proximal anatomy must be restored and stabilized before addressing the tarsometatarsal joint. Postoperative anteroposterior radiograph demonstrates restoration of normal midfoot alignment. Screw fixation was used to stabilize the cuneiform prior to realigning the Lisfranc joint. Due to comminution of the second and third metatarsal shafts, Kirschner wires were used to hold their position. In this case, due to continued instability, a wire through the fourth tarsometatarsal joint was also used. Preoperative anteroposterior radiograph demonstrates a Lisfranc injury with associated distal fracture. Note the displacement of the base of the first metatarsal. Postoperative anteroposterior radiograph demonstrates fixation of the metatarsal, as well as stabilization of the Lisfranc joint. Preoperative anteroposterior radiograph demonstrates a missed old Lisfranc injury with subsequent valgus foot deformity and painful weight bearing throughout the midfoot. Preoperative lateral radiograph demonstrates loss of plantar integrity through Lisfranc joint area. The normal linear alignment of the bones from the metatarsal to the talus is lost, with a sag at the tarsometatarsal joint. In this postoperative anteroposterior radiograph demonstrating reduction of Lisfranc alignment and screw configuration for tarsometatarsal fusion, note that only the medial 3 joints are fused. The lateral 2 joints remain mobile and actually open up when compared with the previous pictures. Postoperative lateral radiograph demonstrates restoration of alignment with tarsometatarsal fusion.